Like other vertebrates, human beings have an internal skeleton that supports the different muscles in the body and protects the vital organs. 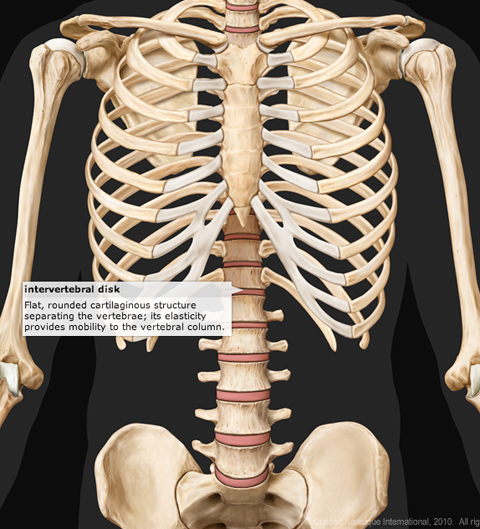 The positioning and articulation of the bones of the skeleton also determine the nature of the body’s movements. The adult human skeleton contains about 206 bones, but this number can vary slightly from individual to individual: some people, for example, have an extra pair of ribs. 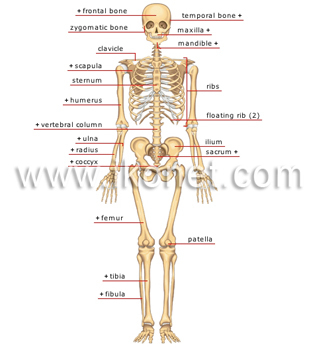 The bones of the human body are part of the axial skeleton (the bones of the skull and the face, the vertebrae, the ribs and the sternum) or the appendicular skeleton, formed of the upper and lower limbs and the limb girdles (the bones of the shoulders and the hips) that attach them to the axial skeleton. 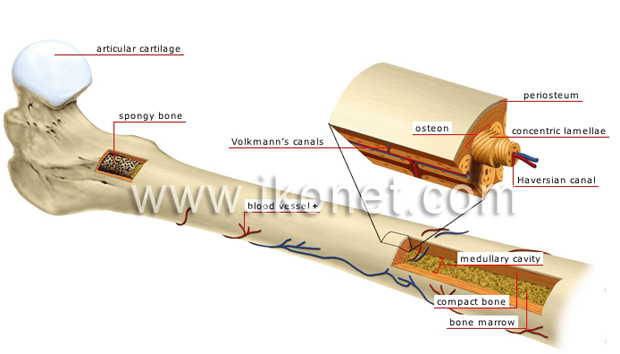 Bone formation starts during the embryonic stage, but many parts of the skeleton are still made of cartilage at birth. Bones do not reach their final size until adulthood. This growth takes place through a process called ossification: cartilaginous cells multiply, die and are replaced by bone cells. A bone is 6 times as strong as a bar of steel of the same weight. This remarkable strength comes from the nature of the bone tissue. All bones are composed of groupings of compact and spongy (or cancellous) tissues in different proportions and positions depending on the type of bone. These tissues contain collagen, a protein that gives bones their flexibility, and mineral salts (calcium and phosphorus), which are responsible for their solidity. The 200 or so bones that form the human skeleton have a variety of shapes. 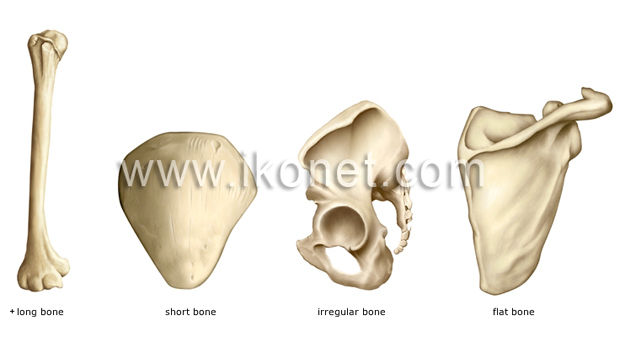 There are generally four types of bones, classified by their appearance: long, flat, irregular and short. This classification highlights the match between a bone’s shape and its function. 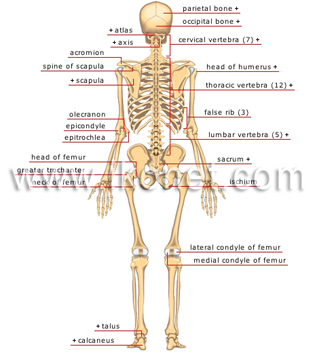 The long bones, for example, such as the humerus, femur and clavicle, are, as their name implies, long and thin. 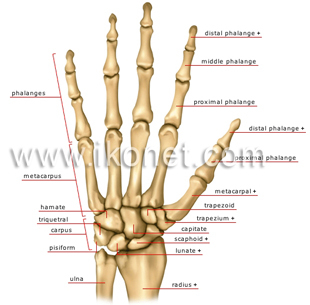 However, some are quite small, such as the phalanges of the fingers. The 4 limbs of the human body contain mainly long bones, to which the motor muscles attach. 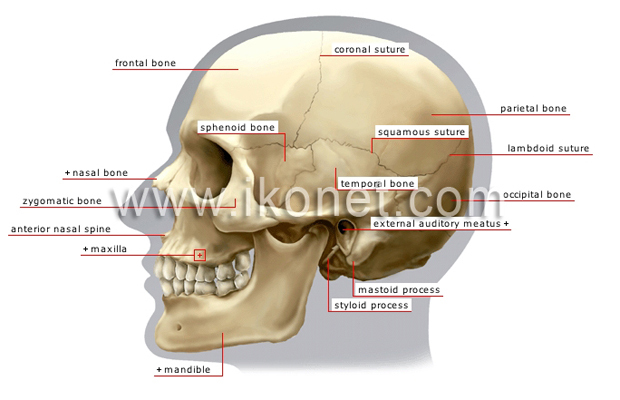 The head: The skull is not a single bone, but is rather formed of 8 different bones that gradually fuse together during growth. 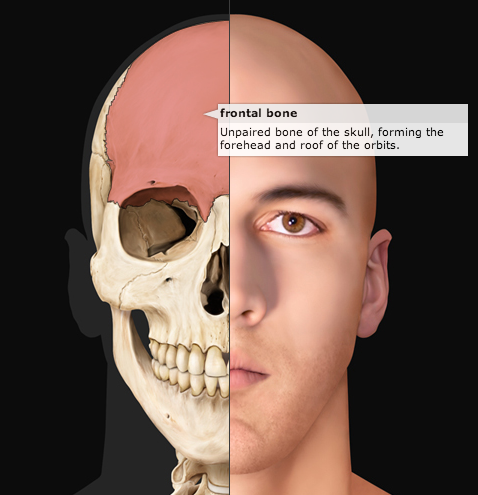 The more numerous bones of the face are irregular in shape and define the cavities of the mouth, the nasal cavities, the eye sockets (orbits) and the sinuses. 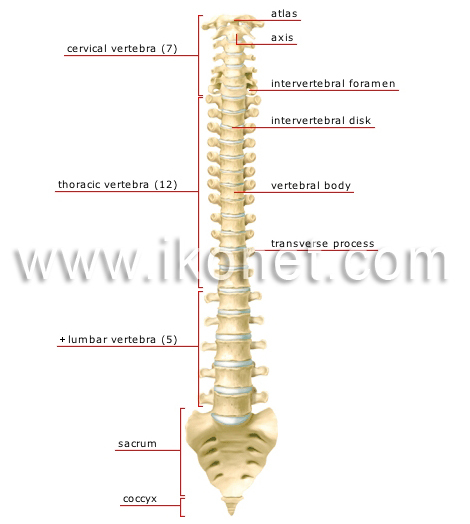 The spine: The spine, also called the vertebral column, is the central axis of the human body. It extends from the back of the skull to the pelvis and is made of a chain of 33 small bones, the vertebrae, which house the spinal cord and serve as points of attachment for the ribs and muscles. The hand and the foot: As the human species has evolved, the function of the hands and feet has become very differentiated: the hands are used to grasp, while the feet provide stability and mobility for the body. 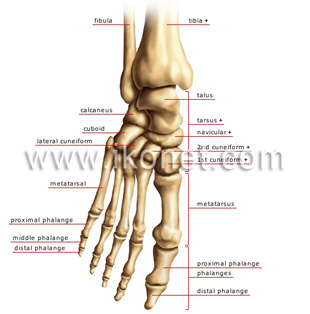 In spite of these functional differences, the hand and that foot have very similar skeletons. In both, there are 5 digits formed of phalanges, a central part composed of 5 long bones and a back part composed of short bones that join them to the limb. Our 2 hands and 2 feet contain a total of 106 bones, more than half of all the bones in the human skeleton. Broken bone will heal itself. At the moment a bone is fractured, blood runs out from the torn blood vessels and forms a clot. Special bone cells then move into the area of the injury and make a fibrous plug called a callous. Gradually, the callous replaces the blood clot and connects the two broken ends of bone. Over time the callous is transformed into actual bone tissue. For a fracture to heal, a doctor often puts on a cast to keep the bone from moving while it mends. It takes about two months for the bone to repair itself and for everything to return to normal. A German physicist named Wilhelm Conrad Röntgen discovered X rays in 1895. He found that these invisible rays had the ability to pass through the body and trace an image on a photographic plate placed on the other side of the body. While X rays can travel easily through soft organs like the skin and muscles, it is harder for them to penetrate denser material like bone. This results in an image showing white traces where the bones should be. Within months of Röntgen’s discovery, many doctors were using the mysterious rays to help them diagnose fractures. Röntgen was awarded the Nobel Prize for his discovery in 1901.